Evening folks…title of this one 'Watching The Rising Sun'. This is a photograph I have been trying to get for close to a month now. For a brief few minutes, just as the sun is coming over the horizon, everything the sun hits takes on this red/pinkish tone. 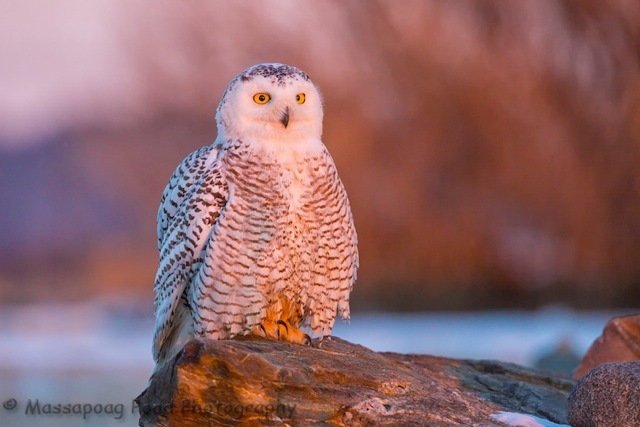 When I photographed the sunrise back about a month ago, I noticed how stunning the owl looked in this light. But on that morning I didn't have time to get around to the oceanside to capture the owl in that magic light, as the light changes so quickly. So on that morning I had to settle for the sunrise, knowing I would be returning for this photo, but not knowing it would take so many trips! Unlike all the other mornings that I arrived before sunrise, either the horizon had a cloud bank or the owl was not in a good location. When I arrived Friday morning the conditions were great with no cloud bank on the horizon. Next I located the owl perched out by the ocean on the rocks, so far so good. So I grabbed my equipment and headed out to where the owl was and just waited for the sun to rise. The owl just sat there just watching the sun rise as this beautiful light began to illuminated her. It was just such a magical sight to witness and photograph! 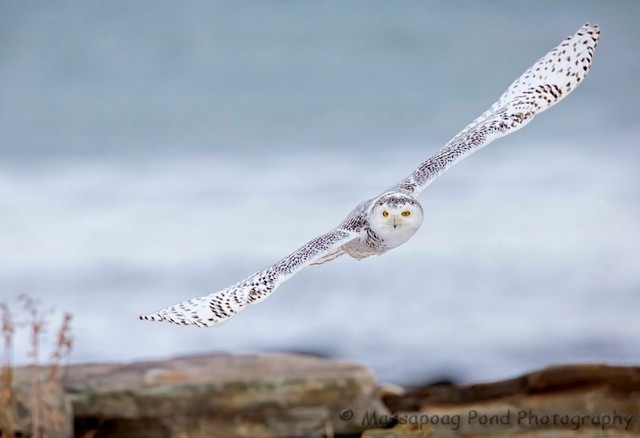 Such a great morning…..
Evening folks…here is Snowy Owl just taking flight, their wing span is 50-55" inch, it's impressive when they are this close. 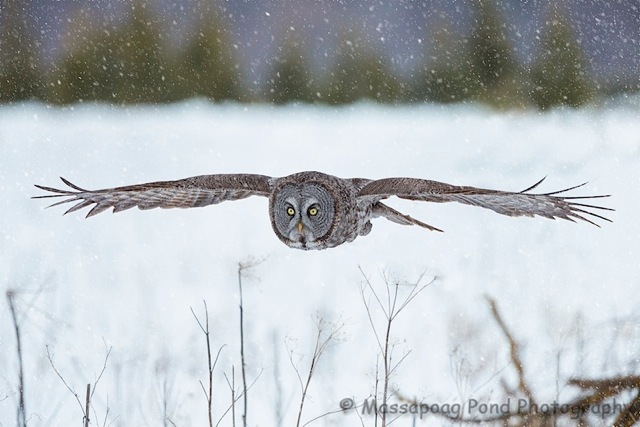 It has been such a treat to see and photograph these beautiful owls this winter. Soon they will be starting to return back to the tundra for the summer. I hope anyone that wanted to see them did, it might be a longtime before we see numbers like this again. Evening folks… last Saturday while out photographing Snowy Owls this Mink popped out of the water in front of us. This happened to a buddy of mine a few weeks back and one of the owls flew over to see if it might be food but decided it wasn't. 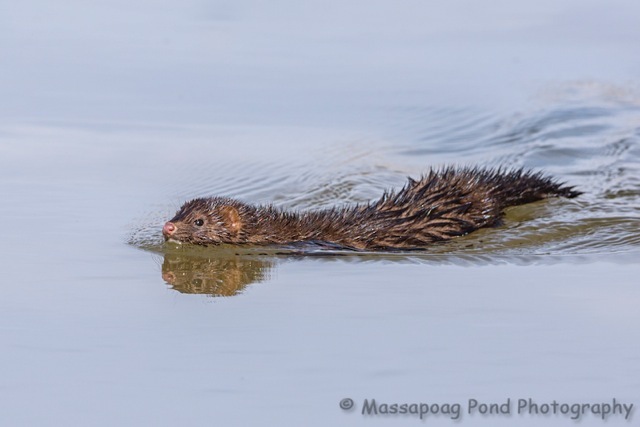 On Saturday the mink came out of the water and ran with 75 feet of the owl, I'm still wondering what made the owl think it couldn't take on the mink. It might have been an interesting battle if it had!